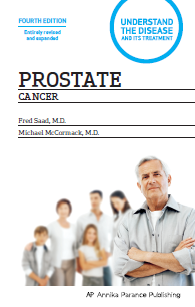 Sanofi has partnered with the Canadian Urological Association (CUA) to make available an electronic version of Dr. Fred Saad’s book – “Prostate Cancer – Understanding the Disease and it’s Treatment”. Dr. Saad is Professor and Chief of Urology and Director of Oncology at the University of Montreal Hospital Centre. The Manitoba Prostate Cancer Support Group wishes to thank Sanofi Pharmaceuticals for allowing us to display this book on our website. 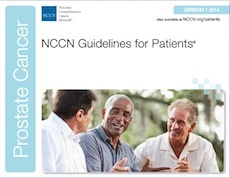 We are pleased to announce that NCCN has given us permission to have a direct link to their 92 page book - "Guidelines for Prostate Cancer Patients". guidelines for most cancers, and dedicated to research that improves the quality, effectiveness, and efficiency of cancer care. has 2 excellent books that can be downloaded. 1. Information for men newly diagnosed with prostate cancer. 2. Dietary advice for prostate health. Have you recently been diagnosed? Prostate Cancer Canada in Toronto, Canada. Not only does this site have information and video, it lists PCa Support Groups from every province in Canada. Prostate Cancer Research Institute in Los Angeles, USA. American Cancer Society in Atlanta, USA. Anderson Cancer Centre in Houston, Texas. Prostate Cancer Foundation of New Zealand in Dunedin, NZ. Prostate Cancer Foundation BC in Surrey, Canada. Founded in 1994 by University of Pennsylvania cancer specialists with a mission to help cancer patients, families, health care professionals and the general public get accurate cancer-related information. Swedish Medical Centre in Seattle, USA. Information from CancerCare Manitoba, in Winnipeg, Canada.